Remember there was that drug chart in schools that compared candy to prescription medication. The likenesses were uncanny...and scary for young children! Now packing peanuts look like pale Cheeto Puffs and rat poison comes in little pouches that resemble fruit snacks! Hello!! Children in the home! Yikes. I always thought Cheetos tasted pretty much like packing peanuts! Never been a big fan! Great comparison! Mmmmm "Packing Puffs"! If they're the biodegradeable ones I think they're made of some corn by-product anyway. Shake a little popcorn cheese on them and you've got a whole box full of Cheetos!! Lucky for us I only like the crunchy not the poofy ones!! Cheeto's do look like packing peanuts. I never even paid attention. I have to agree with Mel Fraase on this one, I like the crunchy one's better. BTW you got the right answer, but I think it was like '86. Watch them come out with some White Cheddar Cheetos now. I hope those came in that box by the way. I like to know I'm not the only person who gets chips in the mail. 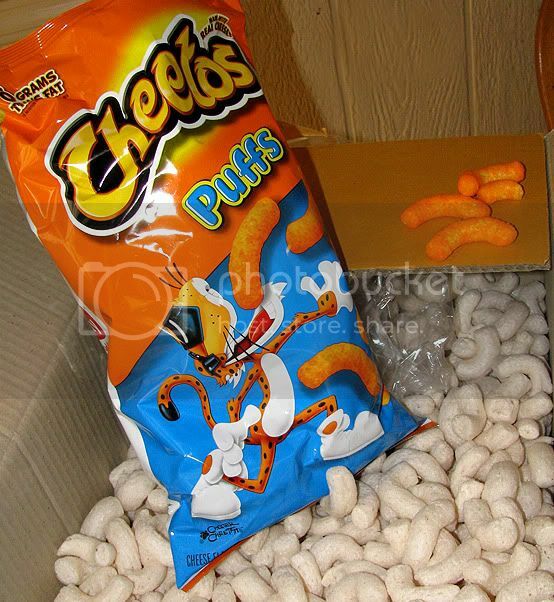 i have never received packing peanuts in the shape of cheetos. i love cheetos though. especially the stained orange fingers, tongue, and lips. when a package comes with them i take them immmediately away to avoid lil' D getting a hold of them. i take them to the local UPS store. they recycle them. 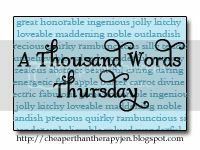 happy ATWT and take care. Yes, the resemblance is uncanny. I tasted packing peanuts, they pretty much taste like cheetos. You just need some garlic powder and parm and you have a whole box of crappy snacks there! that is too funny! My kid would probably try and eat them! I wonder if they use the same type of machine to manufacture them? Interesting comparison. If they are biodegradable you can wet the ends and let your kids make statues out of them. They stick together like glue. That's probably what happens the the cheetos in your arteries too, lol. yikes, I hate those peanut things they get everywhere! So, so true. Great picture!! I LOVE cheese puffs! And I'm sticking to it. OMG i never even thought about that but now seeing the side by side...wow! Companies just can help themselves to make this stuff look fun to kids. hope they dont think they are white cheddar. That is scary. I hadn't noticed. I've seen "organic" cheese puffs at the store that look just like your packing peanuts...probably taste similar too. The rat poison & fruit snacks comparison is scary...I don't think eating packing peanuts will hurt anybody. Glad I've never had the need to buy rat poison, my kids LOVE fruit snacks. I called my girls over to look at the picture and they went "Yeah Cheetos!" then I said 'See how much they look like packing peanuts?' And they went "Eewwww". On a totally crafty note..if you dip the ends on them on wet sponge, you can stick 'em together and make sculptures...then eat 'em. Oh my....thanks for sharing! I'm gonna start playing along! My blog is private though but I would love to add you as a reader, just let me know! Thanks! Dang it...now I'm going to have to eat some cheetos with my lunch! they would taste the same if it weren't for the powdered cheese!! Cheetos are like a drug to me. I can eat a whole bag by myself, no problem! Hmm, don't think I'll ever look at them the same way after this...ha!! :D They're my FAV!!!! Weird that the Cheetah's torso looks EXACTLY like a packing peanut!